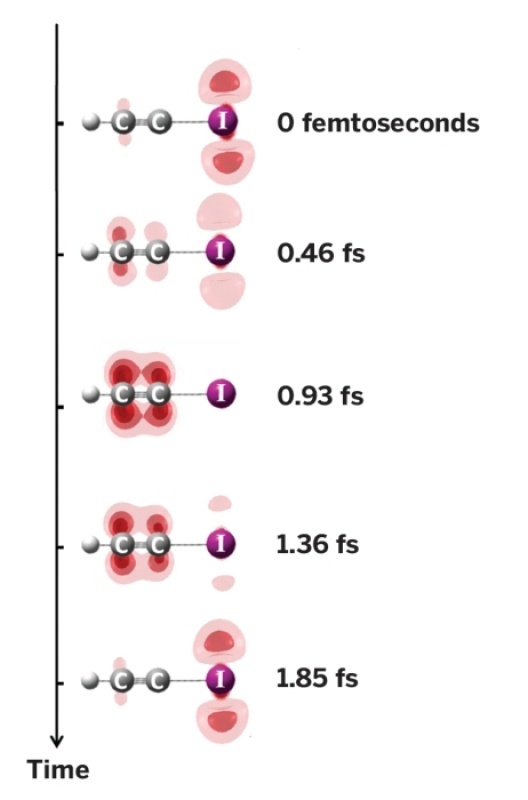 Measurement and laser control of attosecond charge migration in ionized iodoacetylene. The ultrafast motion of electrons and holes following light-matter interaction is fundamental to a broad range of chemical and biophysical processes. An international team of researchers from Switzerland, Belgium, Canada, Russia and Denmark, led by the group of Prof. Hans Jakob Wörner have advanced high-harmonic spectroscopy to resolve - spatially and temporally - the migration of an electron hole immediately following ionization of iodoacetylene. A multidimensional approach, based on the measurement of both even and odd harmonic orders, enabled the team to reconstruct both quantum amplitudes and phases of the electronic states with a resolution of ~100 attoseconds. They separately reconstructed quasi-field-free and laser-controlled charge migration as a function of the spatial orientation of the molecule and determine the shape of the hole created by ionization. The new method allows for the first time the observation of the movement of electrons after ionization - the removal of one electron of many - in a small molecule. The researcher found an extremely fast transport of the charge from one end of the molecule to the other in 930 attoseconds, and demonstrates that such transport processes can be actively guided by laserlight. The new technique opens the prospect of laser control over electronic primary processes. Fig. 1. Electron-hole density in iodoacetylene is shown migrating after laser-induced ionization with the molecule oriented perpendicular to the laser polarization field.